Filtration of blood through the glomerular barrier, known as "Glomerular Filtration", is the first step in the process of urine formation. Blood entering the glomerular capillaries is filtered into Bowman's Capsule from where it enters the remainder of the nephron. The glomerular barrier is highly permeable and nearly 20% of the plasma volume entering the glomerular capillaries is filtered through into the nephron. However, filtration is also highly selective and only allows water and small molecules pass through the glomerular barrier. Here we discuss the physical basis by which the glomerular barrier can achieve both high permeability and selectivity. The glomerular barrier is composed of three basic layers which separate blood from Bowman's Space (See Glomerular Histology for a more in-depth discussion). The first layer is that of glomerular capillary endothelial cells which are fenestrated, allowing for high fluid permeability. The second layer is that of the glomerular basement membrane which invests the fenestrated endothelial cells. The third layer is that of podocytes, a specialized type of epithelial cells with foot-like processes that support the glomerular basement membrane. As mentioned, the glomerular capillaries display an enormous permeability to water and small molecules far beyond that of most other capillary beds. The physical basis of this incredible permeability is the fenestrated nature of the glomerular endothelium which facilitates molecular transport across the glomerular capillaries. 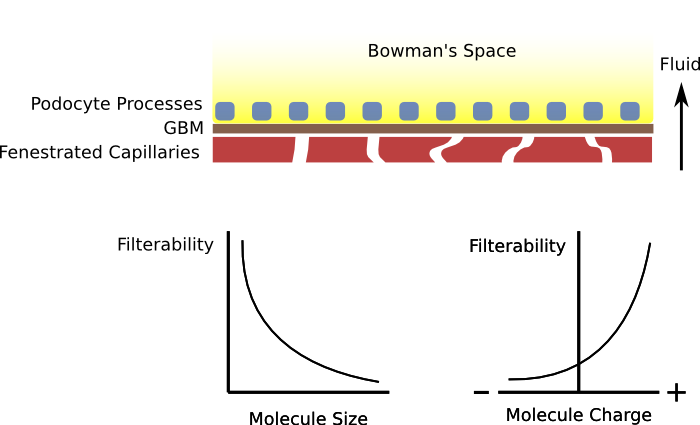 The glomerular barrier allows for large volumes of fluid filtration into bowman's space but also exerts some selectivity on the molecules that are allowed to cross. The barrier itself is composed of fenestrated capillaries invested by the glomerular basement membrane (GBM). Although highly permeable to water and small solutes, the glomerular barrier is also highly selective and prevents the passage of nearly all plasma proteins and cells. Studies have shown that the glomerular barrier selects for two basic molecular features: size and charge. As the molecular weight of a molecule increases, its capacity for filtration progressively and rapidly declines. Furthermore, for any given sized molecules, its capacity for filtration progressively and rapidly declines as its charge becomes more negative. Because plasma proteins are typically large and negatively charged, they are almost totally prevented from crossing the glomerular barrier. The physical basis for the size and charge selectivity of glomerular filtration is that of the glomerular basement membrane and its supporting podocytes, although the basement membrane appears to be most important. The glomerular basement membrane is a tight meshwork of negatively charged glycoproteins. This meshwork not only provides a physical barrier to large molecules, its negative charge repels other negatively-charged molecules. Podocyte foot processes also appear to display a strong negative charge which enhances the repulsive power of the basement membrane.